Q: As the person who spearheaded the committee that deliberated with the general public to seek their views on the new constitution, what is your opinion on the proposed constitution? Now, the Constitution making process has started in the proper way this time. It has to be a constitution of the people. If it is a constitution of the people, the first step will be consulting people. Consulting people is the proper step. In fact, it is the necessary step to determine the type of constitution and what they expect from it. It did not happen in 1972 or 1978. When those two constitutions were drafted, people were never directly consulted. The 1972 Constitution was not a people’s constitution. It was the constitution of the United Front government. There were discussions in closed circles. The 1978 constitution was drafted in secrecy by the United National Party (UNP) government. The 1972 Constitution lasted only for six years. The 1978 constitution still exists. But, the clamour for the repeal or the Amendment of the Constitution has been there from 1978 itself. It is a major issue. When former President Chandrika Bandaranaike came to power, she promised to bring a new Constitution. 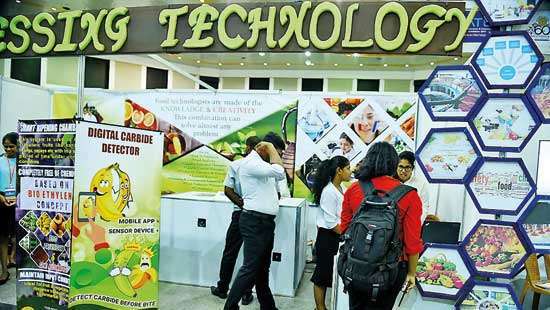 Thereafter, everyone including former President Mahinda Rajapaksa promised to bring it. It shows that the lifespan of those two Constitutions were short. They were not of the people, but were drafted by the parties in power. This time, they have started the process in the correct way by asking me. The Committee headed by me was set up for consulting people regarding the nature of the future constitution. The mandate given to us was to ascertain the views of the people on Constitutional Reforms and report to the Constitution assembly with our recommendations. Q: You made quite a number of proposals and recommendations. How certain are you that those will be incorporated in the new Constitution? The mandate given to my Committee was to ascertain the views of the public and report them to the Constitution Assembly. We started the process on 20 subjects. We sought public submissions on these 20 matters such as the nature of the state, devolution, presidential system of governance, religion. These were 20 issues we intended to deliberate with the people. We received oral representations running into 2216. Out of that, 50% were from large organizations such as trade unions, professional bodies, civil society, and academic organizations and so on. And, so our recommendations are based on views expressed by the people. Q: What are the views of the public as you gathered? Some are for a Federal State. Some were against it. They were for a Unitary State. There were some supportive of the presidential system. There were others for the complete abolition of executive presidency. We found some advocated a diluted form of executive presidency. People expressed different views regarding all. We have presented them to the Constitutional Assembly for consideration without any reservation. We have not tried to conceal any views expressed by the people. Then, it comes to the second stage. That is our recommendations based on the 20 issues on which we engaged with the people. Our Committee of 20 members was divided regarding the recommendations, actually on certain recommendations. We were divided on the status to be accorded to religion. On the nature of state, we faced division. Q: Where did you see unity? 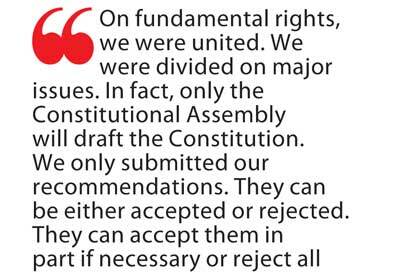 On fundamental rights, we were united. We were divided on major issues. In fact, only the Constitutional Assembly will draft the Constitution. We only submitted our recommendations. They can be either accepted or rejected. They can accept them in part if necessary or reject all. It is up to them. Q: Based on your own experience, how is the demand for making Sri Lanka a secular State? I have to explain one point. We decided to present the majority opinion on each of these issues along with the alternative proposals we identified. The method we adopted was to express those alternative recommendations , and regarding each of them, we have mentioned the names of those who stood for them in the footnotes. It is a transparent process. Then, the Constitutional Assembly knows what we did clearly. It knows these are the people who stood for them. 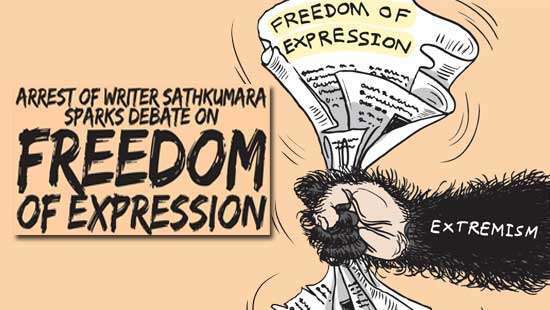 Under the present Constitution, Article 9 says that, in Sri Lanka, Buddhism will be given a prominent place but subject to Article 10 and Article 14(e), Article 14(1) (e) of the Constitution. The present constitution does not say that Buddhism is the State religion. Article 10 says that all religions have the right to practice their religions in Sri Lanka. That is a group right. But, Article 14 1 (e), the chapter related to human rights, says every person has the right to follow, practise, teach and propagate his religion. Then, when Article 9 is read subject to these two Articles, Sri Lanka is a secular State even today. Q: What is the stand on the present unitary status of the country? We remained engaged with all the parties concerned including the Tamil National Alliance (TNA). None was for the division of the country. They were positively against division. If we are to bring about radical restructuring of the state, it will disturb stability in the country. What we thought was it was absolutely necessary to at least protect this stability and the process of reconciliation that has started after the end of the war. Because the verdict of the January 8 election is very clear. It was for the democratization of state and for national reconciliation. Those were the two slogans that were put forward. People, right across the country from the north to the south, voted for it. This is the first time in the history of Sri Lanka, people in the north and the south, voted on one demand. That is for the democratization of the state and national reconciliation. Even, Prime Minister the late D.S. Senanayake did not get it. Here, President Maithripala Sirisena got the support from all over the country. Here, the whole country voted for one man, a Sinhalese. The President is seen as the leader of the whole country. He can go to the North and walk on the streets. Who thought that the President of the country would be able to go to the North? This change has to be realized. The task of those making the Constitution is to ensure that the aspirations of people expressed at the January 8 election are protected and fulfilled. Democratization of society takes place. That is the paramount responsibility of this government. Some people are for a Federal State, and some for a Unitary State. Most people are for the latter. People are not ready for a radical change of the structure of status. We have not said a Federal State as a result. 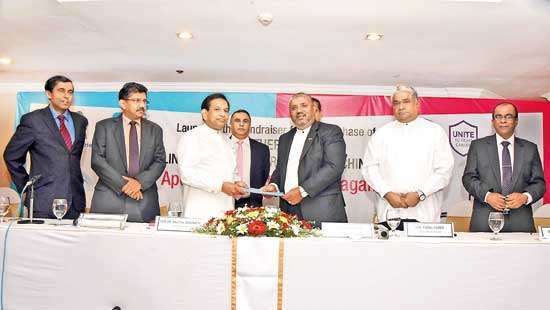 What we have said is the maximum devolution of power to the Provincial Councils (PC) through the 13th Amendment. PCs should be strengthened with resources to run their affairs. We have sought power sharing at the centre so that there is equality. We are not recommending federalism. But, equality should be there. Our recommendations are based on power sharing and equality. That is power sharing at the centre and the periphery, and within the centre itself. Q: How is your engagement with the proceedings of the Steering Committee involved in constitution making? Our task really ended with the handing over of the report on May 16, 2016. But, it was really decided that the main document before the Constitutional Assembly is our document. So, we were invited to attend certain meetings of the sub committees appointed by the Steering Committee. There were six committees appointed on various subjects. We were, among others, invited to present our views or clarify them. Q: In your view, how soon would the new Constitution become a reality? I am not in a position to say it. On Constitution making, they have summoned international and local experts and had discussions. The six Committees have forwarded their reports to the Steering Committee. The Steering Committee will consider these reports. Afterwards, a report will be submitted to the Constitutional Assembly. It is up to the Constitutional Assembly to include these concepts in the new Constitution. Once concepts are accepted, drafting will take place. The Prime Minister looks optimistic that he can get along with the process by the end of this year. I am not in Parliament. Q: How do you see the stability of the government to ensure the passage of the new Constitution? As far as I am concerned, this is the most stable government after 1978. Once the two main parties get together, that is there. They now work as one party. Q: What about the public support at a referendum? It would be there as long as the two main parties are there together. In case Sri Lanka Freedom Party (SLFP) is divided, the divided section with the government would get at least half of its vote base. The TNA would fall in line. Janatha Vimukthi Peramuna (JVP) would also do the same. 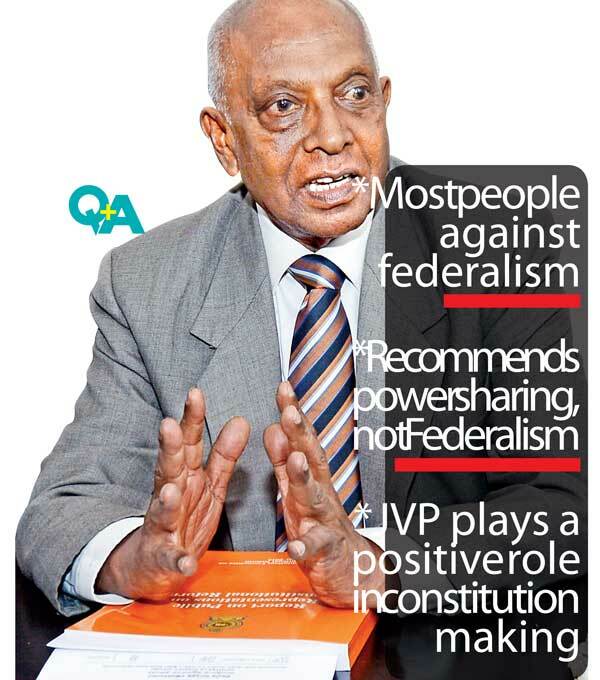 The JVP is playing a very positive role in Constitution making. I must appreciate it. They do not go by petty politics. They are very cooperative as far as I am concerned. Their views are very positive. Therefore, I do not see a major opposition to the new Constitution from JVP. Their views should be accommodated to a certain extent. The President and the Prime Minister are very keen to see that. The TNA would come in if there is national reconciliation. Now, the Office of the Missing Persons is being set up. I do not see a major obstacle in getting people’s approval at a referendum.